Years ago, Ron Bryan was managing a mall cart kiosk business in the Atlanta, GA area, when Pacific Link Sunglasses General Manager, David Rice, approached him about joining his company. Bryan had been one of the sunglasses wholesaler's best customers, and over various business talks, Rice recognized a lot of good old fashioned merchandising know-how in the young salesman. The executive knew it was time to move in and make an offer. Initially, Bryan turned him down. "Yet then, after a few months, Mr. Rice called me again and asked me if I was still 100 percent sure about my decision. At that point, I decided to go down and listen to what he had to say. The rest is history." Bryan joined as a regular sales rep in January 2004, and in just over three years, he has built his way up to Sales and Marketing Director for the firm. What led to his rapid ascent was a whole lot of elbow grease, handshakes and long days with a phone constantly in his ear. It turned out Rice was extremely right about Bryan. He has helped the Dalton, GA., based wholesaler grow by at least 10 percent annually in recent years. "We expect steady growth for years to come, too," Bryan affirmed. It is easy to see why Bryan and his team are optimistic about the future. After all, a wholesale business is only as good as its products, and one look at the fantastic sunglasses selection available at www.sunglassespacificlink.com is all you need to be sold on the company. Pacific Link has three major proprietary lines of stylish and durable sunglasses. They include the sporty Element Eight products, the fashionable DD Eyewear lines and the trendsetting EE Eyewear selections. The wholesaler also offers 20 general product categories at www.sunglassespacificlink.com, such as celebrity eyewear, urban vogue, retro plastics, metal sports, aviators, speed goggles, casual lifestyle and reading glasses. Many include dozens of assorted colors. "Element Eight and DD Eyewear are probably our hottest two lines," Bryan said. "The wholesale prices average in the mid $20s per dozen, though we work one on one with our clients in terms of pricing arrangements to fit both parties' needs. We realize that merchandisers from different venues like flea markets, malls and convenience stores have different needs. We work with them to get all the information to make a deal that is fair for everybody." What makes the Element Eight line so attractive for retailers is the product's sleek and tasteful winged logo, which appears at the center of the nose bridge and along the sides. Bryan said consumers love the logo, adding that the perceived value of the sunglasses is unusually high. "It is a step up in the sports category," he said. "There are about 160 styles in our category for sports, and the Element Eight line has just been phenomenal for us. The logo and style sell it for you. But DD Eyewear and EE Eyewear are really right there in terms of growth. Even though they are more fashionable and trendsetting, just about any kind of store can move them as well." It is worth noting that one of the things Bryan learned while in the retail business was that having the best products always in stock is paramount to good wholesaling. He knows all too well that nothing is more frustrating than not being able to get your hands on a hot item. With that in mind, Bryan makes sure that Pacific Link always has thousands of dozen sets, for nearly every style, on hand in the warehouse. Meanwhile, the sunglasses are being picked up by all kinds of retailers, from convenience stores to gift boutiques, drug stores to department outlets, tourist shops to flea markets, and more. Pacific Link sends out thousands of catalogs per year to such locations, where buyers sometimes like to use the print books to browse before placing their orders online. "We definitely want people to use our website for orders, but there are still people who prefer to have a catalog, too," Bryan explained. "While it is hard to keep the styles up to date in the print catalog, we understand there is still an audience for them and will continue to make them available." 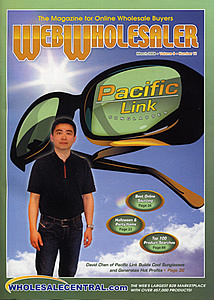 It is easy to see why Pacific Link likes to direct its patrons to SunglassesPacificLink.com. The firm has a top quality website, which reflects company owner David Chen's organization wide emphasis on customer service. For example, the site has a handy search by style numbers function, which can be accessed at any point in the cross page navigation, appearing on the left hand side in clear view at www.sunglassespacificlink.com. All viewers need to do is punch in the product number, and the website will bring the requested sunglasses style to the fore. This application is especially handy for buyers who like to combine the resources of the catalog and the website, allowing them to simply write down the product numbers they are interested in and fill their online shopping carts later on. The site offers three other sections that help make browsing easy: New Arrivals, Upcoming Styles and Super Savers (a closeouts section). The New Arrivals section, for example, is updated daily, as Bryan and his staffers add products when they come in. In addition, the section breaks down available items according to the month when they arrived. "If you look at the section right now at the beginning of the month, it might only show eight styles," Bryan said. "Come back and visit in a couple of days, though, and that eight will turn to about 28. That is how dramatically the selection changes daily." Potential buyers can also get an early heads up about emerging sunglasses styles in the Upcoming Styles section by calling the company to get a password. That special access is just one of the many advantages of being a customer at Pacific Link. "We do not care how small your order is," Bryan stated. "So if you want to place a $75 order at first to test the waters, then that is all right with us. We used to have a $200 minimum order. But you know what? I now think that is silly. The customer may only order $100 or less, but they might end up placing an order for that amount every week or once a month. Of course, that makes their business more than worth it." It is not the most profound discovery in the world, that converted retailers make great wholesalers, but it is one that seems to be proven time and time again. Bryan is another classic case, and Pacific Link's customers are the grateful beneficiaries. Bryan's retail background gives him an edge, in that every minute of every work day, he is thinking about his customers' needs and what his team can do to meet them. While he is always looking for new and better solutions to the problems that every business comes to know, he never forgets the fundamentals of customer service. Instead, he applies them deftly to the company's Internet audience, for whom time and speed are everything. "We update our site every day, we get our orders out same day, we are not a middleman; we are as direct as it gets," Bryan said. "We do everything same day, ASAP, in order to best serve our customers. It is not a situation where if you send us an order, that we will wait two days to get it out the door. The order will go out the same day." The revenue successes Pacific Link has achieved have inspired it to launch its own retail site for the Element Eight brand (www.elementeight.com), which underwent a soft launch in January. Of course, Bryan and his team are rightly hopeful that it will become the same kind of champion that their wholesale business has become. So how exactly has Pacific Link attracted the customers on which its vigorous business has been built? Bryan explained that they lean heavily on trade shows and print advertising to get the word out. "Web Wholesaler Magazine, East Coast Merchandiser, Western Merchandiser, Midwest Merchandiser, Cover Magazine, you name it, and we have a full page, full color ad in there," he said. "Word of mouth is also very important to our success. It is the backbone to any business in terms of continual growth." Perhaps most importantly, the executives at Pacific Link have established a team oriented culture among staffers. In addition to Chen, Rice and Bryan, its staff includes accountant Christy Bradfield, bookkeeper, Shannon Fox, salesman, Michael McDonald, and saleswoman, Brittany Bradfield. "We have a core group of people with five years' experience plus," Bryan said. "Without them, we would not be where we are today. They are very selfless." Without question, each staffer goes to bat for the other if need be, with no strings attached. For instance, last August during the peak of trade show season, Bryan's wife had to be rushed to the operating room for the premature birth of their baby. He was not surprised to see his team take over his responsibilities for the big ASD/AMD Variety Merchandise Show at the Sands Expo & Convention Center in Las Vegas, allowing him to stay back in Georgia and support his wife and new baby. "We are a family type of environment," Bryan said. "We all work together and help each other out. Each sales rep takes his or her orders individually; we do not send them to the receptionist upfront. We are very hands on. And every day, we hear from new customers that they were referred to us by past customers."